ALBUQUERQUE, N.M. (AP) — Bishops in the United States are denouncing the skeleton folk saint known as La Santa Muerte — a figure Roman Catholic leaders in Mexico routinely have attacked for the deity’s connection to violence and the illicit drug trade. Santa Fe Archbishop John Wester, El Paso Bishop Mark Seitz, and San Angelo Bishop Michael Sis in Texas joined their counterparts in Mexico last week in urging Catholics to avoid honoring the folk saint and called her “antithetical” to the teachings of Jesus. The denouncement comes after Ciudad Juarez Bishop Jose Guadalupe Torres Campos attacked La Santa Muerte, which means Holy Death, in a recent newspaper interview and urged parishioners not to join this “cult.” A number of Catholic officials in Mexico have condemned the folk saint, but bishops in the U.S. have largely been silent on the skeleton image. Popular in Mexico, and sometimes linked to some drug cartels, La Santa Muerte in recent years has found a robust and diverse following north of the border: immigrant small business owners, artists, gay activists and the poor, among others — many of them non-Latinos and not all involved with organized religion. Clad in a black nun’s robe and holding a scythe in one hand, Santa Muerte appeals to people seeking all manner of otherworldly help: from fending off wrongdoing and carrying out vengeance to stopping lovers from cheating and landing better jobs. Others seek her protection for their drug shipments and to ward off law enforcement. Devotees often use Catholic prayers and set up shrines in her honor. The saint is especially popular among Mexican-American Catholics, rivaling that of St. Jude and La Virgen de Guadalupe as a favorite for miracle requests, even as the Catholic Church in Mexico denounces Santa Muerte as satanic. Her image has been used on prayer cards citing vengeance and protection, which are sometimes found at scenes of massacred bodies and on drug shipments. But Sis called La Santa Muerte “spiritually dangerous,” adding that there is no link to Catholicism. “It should be completely avoided. It is a perversion of devotion to the saints,” Sis said. Andrew Chesnut, author of “Devoted to Death: Santa Muerte, the Skeleton Saint” and the Bishop Walter F. Sullivan Chair in Catholic Studies at Virginia Commonwealth University, said the condemnation of La Santa Muerte echoes what both the Vatican and Mexican bishops have been saying for years now. 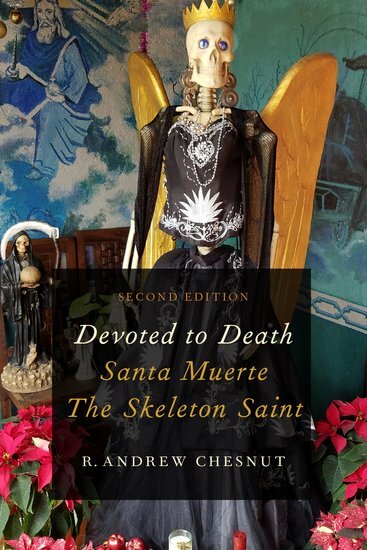 “Given the Church in Mexico has been condemning devotion to Santa Muerte on a weekly basis over the past five years, I’m actually surprised it’s taken so long for an American bishop to publicly denounce veneration of the Mexican folk saint,” Chesnut said. He said Santa Muerte is now the fasting growing new religious movement in North America and throughout the Americas, with the US having the second-largest population of devotees after Mexico.